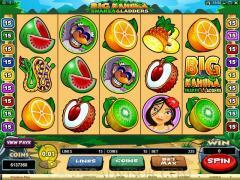 Big Kahuna: Snakes & Ladders is a video slot game offering from Microgaming, the world's best in the online casino software business. This is a five-reel game, with fifteen paylines, allowing for a maximum bet of 300 coins. One of the goals of the game is to retrieve the Big Kahuna's stolen mask. Yes, you will climbing up ladders; that is, if you are fortunate enough to land on one, and you had better be careful, because there are plenty of snakes around to take a bite out of you and send you back down the mountain. You get some spooky sounds in this game that go right along with the theme, but if you prefer not to have the scary atmosphere, you can control which sounds are actually played during the game, or turn them off altogether. Quick Spin is available if you want to pick up the pace of the game, which is understandable if you think that will get you to the top of the mountain faster, or you can choose to go into the AutoPlay option and minimize your interaction with the software itself, if you think that's going to help you avoid the snakes. The wild in this game is the Big Kahuna symbol. It can substitute for all other symbols (except for the scatter) to complete winning combinations. It also can comprise a winning combination itself, and that affords the biggest payoff in the game - 5000 coins on five in an enabled payline. The Snakes and Ladders symbol is a "scatter," which means that it does not have to be on an enabled payline to have its effect, but rather can be "scattered" in places other than that; in the case of Big Kahuna, it's reels 1,3 and 5. 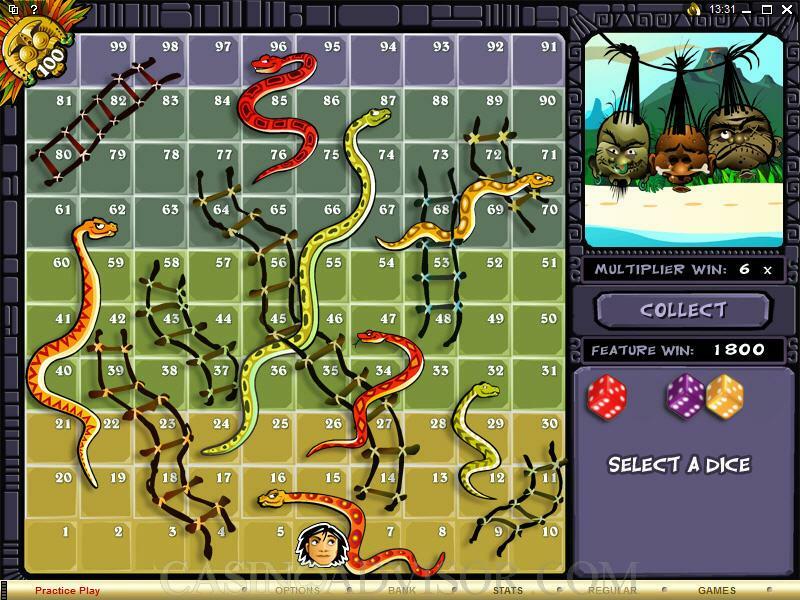 The scatters have to be on those reels to complete a winning scatter combination, and to trigger the Snakes and Ladders Bonus Game, in which you will have an opportunity to retrieve the stolen mask of the Big Kahuna. To do this, you "roll dice" in this game, trying hard to advance on the board to a square that has the start of a ladder on it. If that happens, you start climbing. If you hit a square where the snake is, you will slide on the board as far as the snake's tail will take you. The Free Spins Bonus Game is different than you might see it on most games, in that it is not necessarily triggered by any specific event, but is triggered at random. You will receive five free spins when this happens. 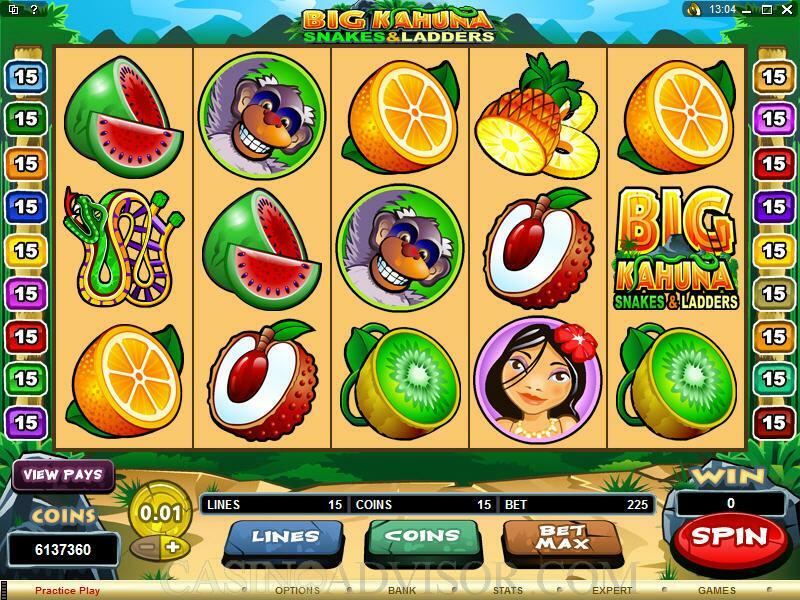 All wins are doubled during the Free Spins Bonus Game, except when the Big Kahuna symbol is being used as a substitute to complete a winning combination, in which case the win is quadrupled. The maximum wager you can make on this game is 300 coins, which you can do when you click the "Bet Max" button (it's brown in this game). The coin sizes go from 0.01 to 0.25. The number of coins bet and the number of paylines enabled can be adjusted and controlled with buttons at the very bottom of the interface. Of course, the red "Spin" button starts the game. 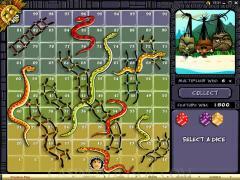 Interested in reading more detailed information about Big Kahuna: Snakes & Ladders? If so Click Here for more details.